The Model HHM59 is a lightweight completely portable digital clamp meter with a 3 1 /2 digit LCD display. 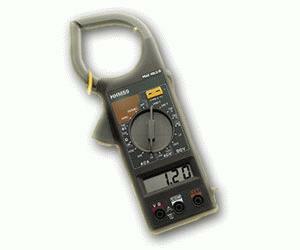 This meter is well suited for use by electricians and technicians who require a portable instrument that is accurate and reliable and that has full digital multimeter capabilities. The integral current test clamp-on jaws make this meter ideal for checking the operation of electric resistance heaters and other devices. The liquid crystal display is readable in all light conditions. The decimal point is automatically positioned, and the polarity indication is standard for negative readings. Overrange and low battery indications are also standard.